Nothing spoils the beauty of a clean kitchen like a heap of unwashed dishes. 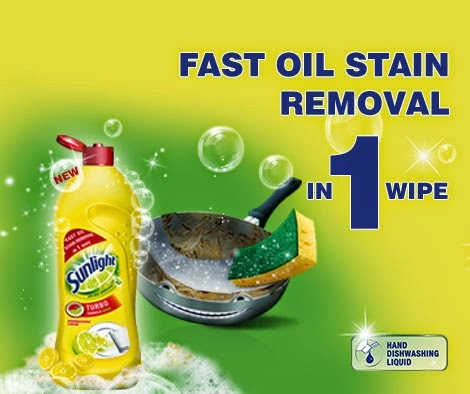 However with Sunlight Dishwashing Liquid, you can have your dishes sparkling in no time with minimal effort. Sunlight doesn’t just make dishwashing easy and fun, it fills your kitchen with a refreshing lemon fragrance. 1. Put dirty dishes in a large bowl and keep it near the sink, this way your sink is always clean and available to wash dishes. 2. Food particles go away faster when you keep the dishes under running water while scrubbing. 3. Dry pots and pans with a paper towel to reduce residue staining the dishcloth. You can dry the glass utensils with a dishcloth. 5. Always rinse off the sponge after washing to avoid the growth of harmful bacteria in the sponge. 6. Wash off starchy and dairy products with cold water because hot water will make them sticky. 7. Wash the least soiled items first before proceeding to the bigger jobs. www.shadeadu.blogspot.com please check out my blog and comment.